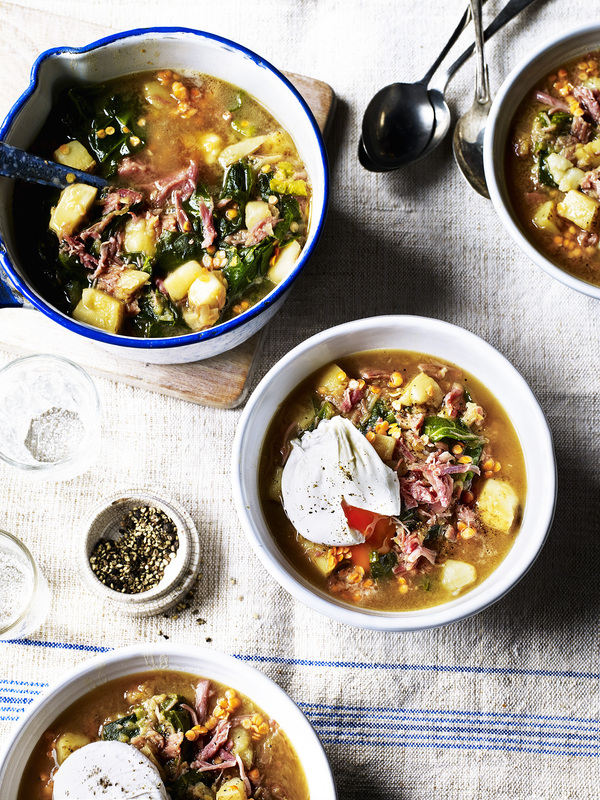 This winter soup recipe is packed with a fantastic blend of ingredients which offer both tantalizing tastes and offers a fantastic consistency to the broth – ham hock, eggs and red lentils are the cornerstone of this. Once you’ve added onion and chicken stock to the equation, you’ve got a filling, delicious meal. Gently cook the onion in the butter and season a little. Add the stock and potatoes and lentils and bring to the boil. Simmer for fifteen minutes, check and adjust the seasoning. Add more water if necessary. Poach the eggs for three minutes. Add the greens to the hot soup, return to the boil and stir well then remove from the heat. Stir in the ham hock. Serve each soup with a poached egg on top and a good twist of black pepper.